Why do they call it Ovaltine? Rocky and Jovan were at The Denver Zoo Monday and they saw a familiar face. Rocky finally summoned the courage to go meet the guy. 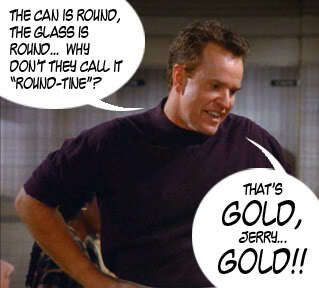 It was Steve Hytner, whom we know and have often quoted from the Seinfeld series, Kenny Bania. Somehow in the excitement of meeting a big-time TV star, Rocky didn’t think to ask if he’d pose for a picture with my granddaughters, Averi and Amelie. I mean – why wouldn’t he want to be seen with those beauties? Especially if he knew to whom he was speaking. I mean it was Rocky. Rocky Rhoades who once auditioned for the movie Indian in the Cupboard. Come on. But honestly? The whole family is star-struck via Rocky and we didn’t even see him! Just know the guy who did.